Well this July marks 10 years of blog writing for me and I can’t quite believe it’s been that long! I’ve always kept angling diaries/log books and the blog was just an extension of that, I had no grand master plan for the blog (and if I had my time again, I’d probably have called it something else!) but I still really enjoy writing it even though it takes up a lot of my time. In the early days I would get home from fishing, write and publish the blog and be up the pub for 8:30!, these days it sometimes doesn’t make it online until Tuesday or even Wednesday! But I do try and make it a good read and add lots of photos (which were missing from the majority of my early posts) and it all takes time. Also at the start I wasn’t even sure if anybody (apart from me) was reading whereas now I’ve had some great feedback from complete strangers at matches and fishing shows and that always makes all my hard work worthwhile. It can sometimes be a real chore when I’ve had a really bad day or blanked but I pride myself on posting every time I go fishing so you get The Good, The Bad and The Ugly! (unlike a lot of anglers on Facebook who only sing when they’re winning!). It can also be quite difficult to keep things fresh and interesting, especially when I fish a lot of matches on the same venues and the same rigs are used etc, it can all get a bit samey. Hopefully features like reviews and interviews stop things becoming too stale although certain things I’ve tried like the Korum Challenge (Mission Impossible) never really got off the ground. My Random Ramblings on the other hand have been very well received and I’m actually very proud of the last three I did (check them out). I’ve written 670 posts to date. My first post was way back on 22nd July 2006 (have a look – First Post) and after 10 years has attracted a grand total of 39 views! My last post (Latest Post) has had 980 views after only a week. The most popular post so far has been my review of the Ringers Pellet Pump (Popular Post) with 3362 views but only 3 people read my account of a match on the Isle in 2008 (and I framed too! Least Popular). Up until the end of 2011 I wasn’t even averaging 1000 hits a month, during May of this year I broke 12000 for the first time with 12091 hits and posts regularly top 1000 views. It took nearly 9 years to reach the milestone of 250,000 hits, as I write this, the blog has hit 379,421 views, so that’s getting on for 130,000 hits in just over a year so hopefully the blog continues to move in the right direction. I don’t really make any money from the blog but then again I never really started it for that reason so if you’re thinking of writing a fishing blog to get rich quick – don’t bother! Food, fashion and of course celebrity gossip blogs on the other hand, do really well, look at Perez Hilton! On the plus side, I do get approached by quite a few firms like Bait-Tech, Kitshack, Ringers and Canvas Design to review their products which I really enjoy doing. Through the blog, I realised a long term ambition when I appeared in a feature for Match Fishing magazine, I also wrote for the now defunct Southern Angler every month and have had articles published by Pondip, The Angling Gazette and several other websites. 2016 has been a pretty eventful year so far with four match wins (two at Dillington and two at Harry’s pond) and four silvers wins at Summerhayes including only my third ever golden peg win. 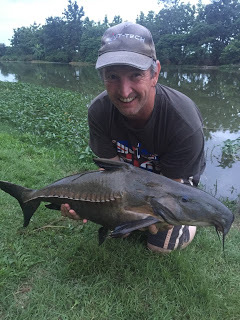 I’ve also had two trips to Thailand where I fished two new venues and caught loads of fish including twelve new species and several new pb’s. So what next for Against Men and Fish? Well along with my weekly match reports, I will continue to regularly update the Where to Fish section, review new products and I’ve already got some great new interviews lined up and as always I will trying to add new species and pb’s to my list along the way. I can’t go without saying a massive thank you to everybody who reads or supports the blog, especially Hayley at Bait-Tech, I really appreciate all the help. If you have any feedback good or bad (as long as it’s constructive), please get in touch via the contact form in the side bar or the blogs Facebook or Twitter pages, I would love to see your photos. match reports and results or if you want your fishery added to the Where to Fish page, just let me know.